When Gabriella Wilsker was looking for a place to live for her first year of university, St. Cathy’s student residence seemed like the perfect solution. Wilsker was moving from Boston, and the community living described on the private residence’s website sounded like a good fit for someone with no connections in Montreal. It was located across the street from Concordia’s EV Building, where she would start classes in September 2013. It came furnished, with Internet, air conditioning and a TV in each room. Wilsker stayed at St. Cathy’s throughout the summer, later deciding to move into a new section of the residence slated for completion for the beginning of September. When she was moving into her new room for September however, Wilsker said it was covered in dust. It also did not yet have the couch and two desks that were supposed to be included in the room. The day before dozens of students were meant to move in, Wilsker and the building’s residence assistants worked to finish the dorms. “They had us moving in last-minute items to the rooms. One kid didn’t have a bed for two nights. None of the rooms with working cable had TVs, which they were all supposed to have,” she said, adding that she moved furniture and set up rooms for 12 hours without pay. Wilsker says she was also charged $20 for her floor to be mopped. By the end of the first week of classes, Wilsker was evicted along with a resident’s assistant that she had recommended for the job. Having not yet signed her lease for the coming semester, Wilsker says she was evicted because she wouldn’t keep her mouth shut about the residence not living up to what was advertised. “They were telling my parents that I was unmanageable, that I was rude, that all the RAs were complaining about me, which was false,” said Wilsker, adding that she was no longer allowed on site because the management said she smoked marijuana. “They wanted to meet with me in person and have me sign something to say I wouldn’t pursue any legal action,” said Wilsker, noting that an RA tried multiple times to get her to sign the agreement, which she refused. Chris Chapin was also evicted from St. Cathy’s, according to Wilsker, for complaining to management about the state of the residence during the first week of September. Chapin declined to comment, as he is pursuing legal action against the management of St. Cathy’s. “He was accepted at the residence, they cashed in the cheque, and for reasons unknown to us they decided to unilaterally evict him without even going to the rental board,” said Angelo Caputo, the lawyer who is representing Chapin. Wilsker also plans on taking legal action against the residence’s owners. However, a current tenant of St. Cathy’s agrees with Wilsker’s account of the move-in. “My room was disgusting. Me and my mom had to go get mops and clean up my room. There was dust everywhere, I couldn’t sleep because of the dust,” said one tenant, Sara*. “I don’t think people wanted to leave, because they knew how tricky it would be to find a new place. We just wanted reimbursement for one month’s rent. People were really ticked off about construction,” she said, adding that the construction of the building’s exterior continued into October, starting as early as 7 a.m. The Concordia Student Union Housing and Job Bank is familiar with St. Cathy’s residence. “[Students] can’t reach anyone who has any ability to deal with their problems. The RAs who are students living there take their complaints, but the management doesn’t get back to people,” said Leanne Ashworth, a coordinator at HoJo. Ashworth says HoJo has been getting complaints about the space for the last few years, but that there was a spike of complaints in September. They do not recommend the residence to students. “The style of management is ‘ignore the students, take their money.’ They take their credit card information online so there’s really no reason for them to communicate with the students for the rest of the year,” she said. “It was stupid hot, it would be about 30 degrees in my room. They didn’t want me to leave my door open, and even with my window open it would be ridiculous,” said Sara, adding that many residents did not have curtains for their windows, and that construction workers could see inside their bedrooms. Internet quality continues to be an issue, and each tenant is now limited to 10 GB of bandwidth each month—although that was not communicated before signing. “They’d be like ‘yeah we’ll fix it, we’ll fix it,’ and they’d never get to it,” Sara said. 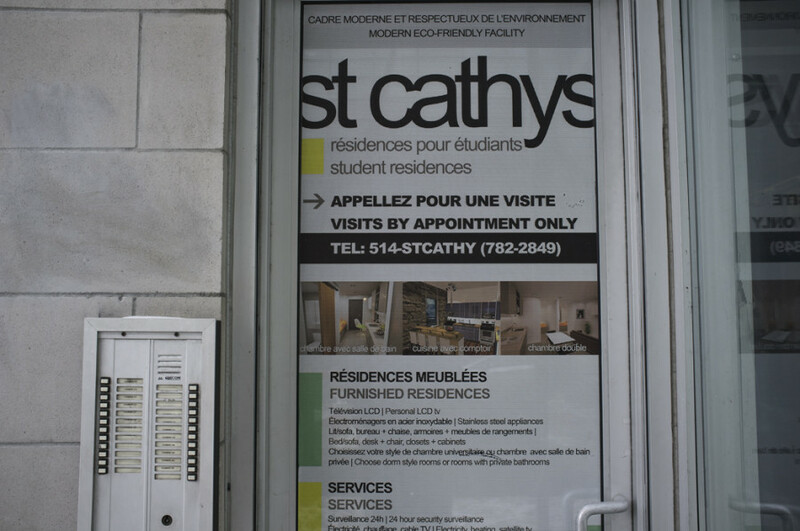 The students in St. Cathy’s took their complaints to the RAs, who receive a discount on their rent as payment. The RAs would then inform Kamel. “We deal directly with Amanda,” said St. Cathy’s RA Ali Murji, noting that a receptionist at the building is also able to take complaints. He said there was some delay with furniture in the rooms for September, but when someone asked it was dealt with right away. Ashworth recommended sending a registered petition to the company, demanding a full month’s rent in damages for the noise and unfinished rooms. The petition, complete with 53 resident signatures, was mailed at the beginning of October. The petition was delivered, but residence management gave no response. Kamel, who manages the residence, says this is because the petition included false information, and that residents did not know what they were signing. They then brought the petition to the Régie du logement du Québec, the provincial rental board, but were told that complaints would need to be filed individually. “It’s an open secret that the Régie du logement wait time is 17 months for non-urgent issues,” said Ashworth. She added that as long as there is “minimal livability” in the space, the request is considered non-urgent—stating that, for example, having hot water shut off would not count as urgent. With the recent surge in private residences in downtown Montreal, Ashworth says this kind of housing is particularly attractive to international students, who are looking for furnished spaces with a lease shorter than the typical 12 months required for apartments. However, these students are less likely to be aware of tenant rights in Montreal. There is also not enough room in Concordia’s residences to fit all first-year students, with a lottery system in place for those looking to live there. St. Cathy’s offers four and eight-month leases in addition to the more common 12-month agreements. Rent at the residence ranges from $695 to $950 per month. Kamel stated that the new residences would have been completed by September if not for the two-week construction strike at the end of June 2013. However, this isn’t the first time the residence has had complaints of construction occurring while tenants are living in the building. One tenant who lived at St. Cathy’s from the fall of 2012 to the spring of 2013 echoed the complaints of construction and dust as early as September 2012. They also noted that there were holes in the wall. “They appeared when the adjacent building was torn down,” said the former tenant, who did not want to be named. She also said tenants were required to provide post-dated cheques and a key deposit, both of which are illegal in Quebec, and that tenants were pressured to sign non-disclosure agreements in exchange for $250. The former tenant planned on reporting the issues, but was unable to get a hearing date with the Régie while she still lived at the residence. Stanislas Olenski rented from UNO Investments from October 2008 to February 2009, when it was named Gap Investments. He sued the company for 50 per cent of his rent, for damages including excessive noise and dust from construction, and was awarded the full amount—$2,458—in January 2012. Sara is glad the experience at St. Cathy’s gave her and her fellow tenants the chance to meet people, but feels like she was taken advantage of during the beginning of her lease. The rooms have since been completed. For Wilsker, she wants people to know how she was treated by the residence’s management. “I just want to make sure that nobody moves into that building again,” she said. HoJo offers legal information and resources on housing and jobs for Concordia students. Their offices are located in room H-260 in the Hall Building. *Name has been changed because the tenant still lives at the residence and did not wish to be identified.